• From 09.00 to 13.00 Saturday. During out of hour times, the laboratory is staffed by a single biomedical scientist to provide a service for emergency and essential hospital test requests. The majority of routine tests have a turnaround time of 2 to 3 hours from the time of sample receipt. Providing a sample is received before 17.00, a result is normally available the same day. We provide an urgent analysis service for a limited repertoire of tests if essential for the immediate management of a critical patient. We aim to have results available within 60 minutes of receipt of specimen. • Send sample(s) to the laboratory by the quickest route (pneumatic tube system or in person). Urgent specimens from the Heavitree site require a porter and/or taxi. NB. A telephone call is essential – failure to telephone the laboratory with details of the urgent request will result in samples being treated as category 3 samples, and will be accorded priority on the next scheduled batch and abnormal results telephoned as soon as they are authorised. Forms marked with “please phone” are treated as category 3 samples. They are accorded priority on the next scheduled batch and results telephoned as soon as they are authorised. Samples from ITU, ED AMU & NNU are automatically assigned category 1 status & treated as urgent. • Pack and send urgent sample(s) to the laboratory in a separate bag from routine patient samples. DO NOT ABUSE THE EMERGENCY SERVICE; IT IS VERY COSTLY AND DEMANDING ON STAFF. IF THIS SERVICE IS USED INAPPROPRAITELY IT BECOMES SATURATED AND TURNAOUNDTIME OF URGENT SAMPLES SIGNIFICANTLY INCREASES. We will process any sample referred to us meeting our sample labelling criteria. We undertake to inform referring centres, without undue delay, in the event of circumstances that may adversely affect the reliability of results or turnaround times. The laboratory requires the assistance of outside referral laboratories to perform analyses that the laboratory does not perform routinely, this may be for examinations or for consultant opinions. Deciding which laboratory to use is be based on numerous factors (e.g. expertise and skill, competency, references, cost, turnaround time, proficiency, proximity, accreditation status, EQA participation). The Blood Sciences Laboratory is responsible for selecting the referral laboratories and takes steps to monitor the quality of performance and ensure that the referral laboratories are competent to perform the requested examinations. This is achieved by letter which is sent to all referral laboratories. A register of all the approved referral centres is kept for all the departments within the Blood Sciences Quality Management System, and this information is requested and updated annually. Sample requests are triaged into 3 categories. These samples take priority over all other samples. These specimens are treated as genuinely urgent, and will be processed immediately on arrival. However, in order to process urgent samples, the requesting Doctor must follow the procedures as outlined in ‘Urgent requests’. Samples from specific wards: ITU, A&E, EMU, CDU & NNU are automatically assigned category 1 status & treated as urgent. Urgent request results are not usually telephoned, but are available on ward terminals within one hour. If results are abnormal, they fall within our telephone policy and are telephoned as soon as they are validated. Category 2 – Waiting patient or ward staff. Suitable only for short turnaround time tests. 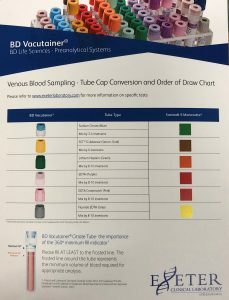 A sample from a waiting patient or ward staff should be brought to the Blood Sciences laboratory and identified as a sample from staff or patient intent on waiting for the result. The sample is processed through the urgent system and undergoes immediate labelling, booking-in and centrifugation, then is taken to the appropriate section for analysis. An analyser print out is given to the person waiting. Samples that are received with the urgent box marked, but no prior urgent telephone request had been made. These samples are allocated to the routine reception area, but are given priority over other routine samples. The results are not telephoned unless they are abnormal and fall within our telephone policy. Results should be available on ward terminals within three hours. Patient samples are only kept for a maximum of 5 days following receipt (2 days for EDTA samples). You must identify the date of the sample you wish to add additional tests onto, stating the add-on tests you require. Please be aware that in small volume samples there may not be enough sample left to conduct additional tests. If this occurs, we will contact you to advise that the patient will need to be re-bled. Results falling outside of the limits below will be telephoned to the requestor or requesting location wherever possible. For GP requests every endeavour will be made to contact the surgery within working hours. Devon Doctors will be contacted out of working hours.